Nobody on the Pahrump Valley High School football roster expected the Trojans to be 0-2 after two games. It’s safe to say none of them expect to be 0-3, either. Peter Davis/Special to the Pahrump Valley Times Pahrump Valley quarterback Tyler Floyd keeps an eye on the line while handing off to Nico Velazquez during last week's game against Virgin Valley in Pahrump. Peter Davis/Special to the Pahrump Valley Times Casey Flennory of Pahrump Valley tries to elude Virgin Valley defensive end Riley Waite during the Bulldogs' 26-24 win over the Trojans last Friday night in Pahrump. Peter Davis/Special to the Pahrump Valley Times Zach Trieb (75), Armani McGhee (73) and Tristan Maughan (45) of Pahrump Valley await the snap before a play during Friday night's home game against Virgin Valley. “We just focused on what we needed to practice on, and we’ll get it done,” senior lineman Brandon Bunker agreed. On paper, if the Trojans can combine the start they had against Lowry, when they jumped to a 32-13 lead, and the finish they had against Virgin Valley, when they scored two touchdowns in the final six minutes, they can beat anybody on their schedule. 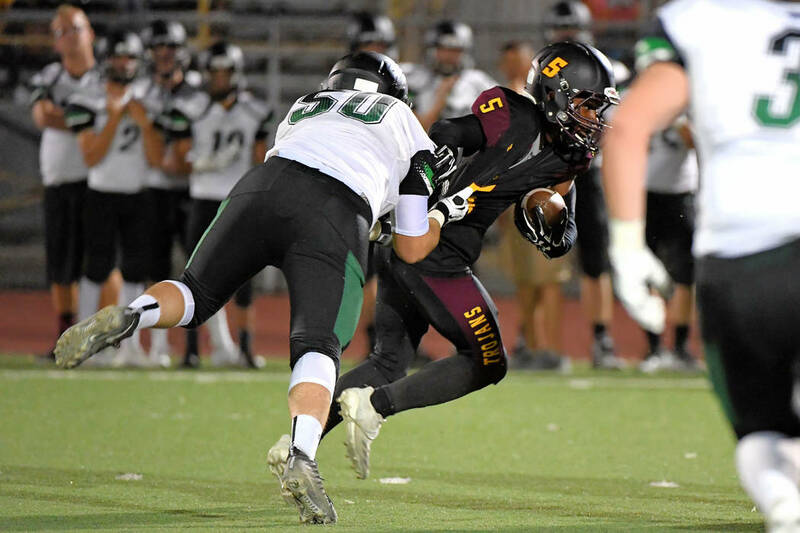 Starting and finishing strong is easier said than done, of course, but tonight’s homecoming game against Sunrise Mountain would be a fine place to start. Coach Joe Clayton has a similar hunch. What has not made sense to Clayton is that the strong start came on the road — after a long ride to Winnemucca, no less — and the poor start came at home, when the first home game of the season brought out a boisterous group of student supporters. His players sound ready to do that. For Clayton, all the Trojans really have to do is exactly what they say they want to do. The opposing team might have something to say about that, but this is not the same Sunrise Mountain team that thrashed the Trojans 41-6 a year ago when both teams were in the Class 3A Sunset League. In that contest, the Miners threw for 201 yards and three touchdowns and rushed for 193 yards and three touchdowns while holding the Trojans to just 3.62 yards per rush. But the Miners have a new coach and a new offensive philosophy, not that it worked out in a 36-0 opening loss to Del Sol last week. Clayton was pleased to hear Bunker, Velazquez and Grossell all expressed a high level of confidence in the Trojans’ ability to break into the win column tonight at home. Who: Sunrise Mountain (0-1, 0-0 Class 3A Sunrise). When/where: 7 p.m. today, Aug. 31, Pahrump Valley High School. 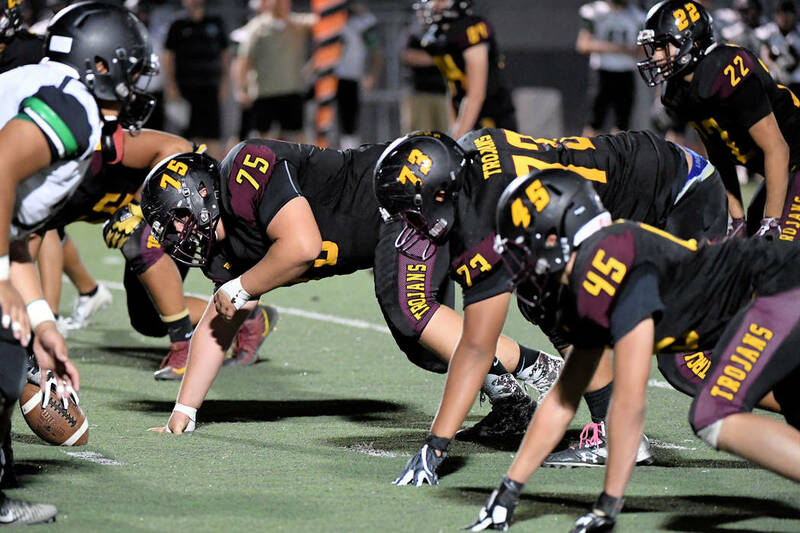 Last week: Sunrise Mountain lost to Del Sol 36-0; Pahrump Valley lost to Virgin Valley 26-24. Next week: Democracy Prep at Sunrise Mountain; Pahrump Valley at Boulder City. Last season: Sunrise Mountain 41, Pahrump Valley 6. About the Miners: Any resemblance to the Sunrise Mountain team that manhandled the Trojans last year is purely coincidental, and it’s not just because of 17 seniors graduating. This year’s edition is a run-first outfit, although the opener against Del Sol revealed something more along the lines of a punt-first outfit. The Miners totaled just 141 yards of offense, averaging just 3.41 yards per carry. Quarterback Tyree Hayes carried 19 times but managed just 59 yards, while Link Rhodes was a bit more efficient with 50 yards on 13 carries. The passing game was non-existent — good news for a Trojans team that has been burned through the air in the early going — as Hayes completed two passes to his teammates and one to the Dragons. Defensively, the Miners were overwhelmed through the air, allowing 387 yards on just 16 completions. 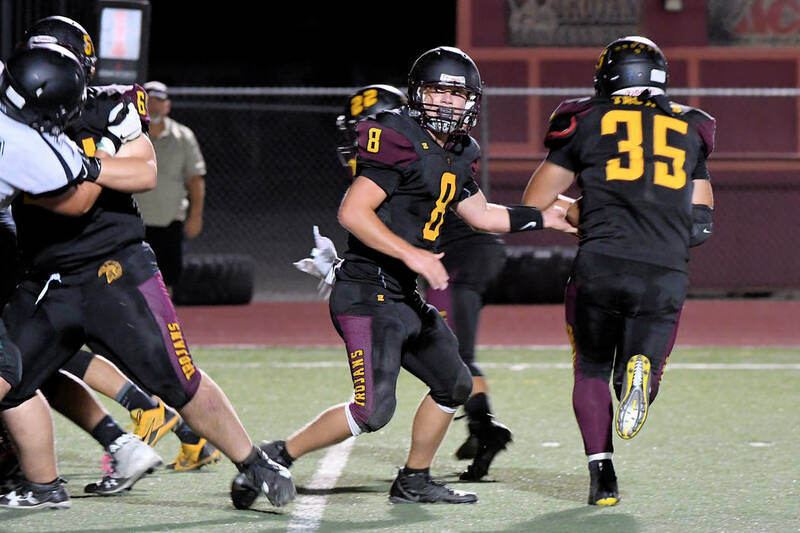 That might not mean much to a run-happy Pahrump Valley offense, but Sunrise Mountain also gave up well more than 12 yards per carry on the ground. The Miners went 6-5 last year, defeating Moapa Valley 30-28 and losing to Desert Pines 48-0 in the playoffs.